The tour Kaa Iya National park commences at the city of Santa Cruz, at 8H00 in a car. The first part of the trip takes you about 4 hours on a paved road to the town of San Jose de Chiquitos. Kaa Iya National park is 90 km on a dirt road from San Jose de Chiquitos. Once in the national park there are only two dirt roads and the trails in the forest are only a few. Kaa Iya National park is an off the beaten tracks destination, so you may not have another group of visitors. and the wild animals are not fed by humans. For now the accommodations is only in tents (It could change at anytime). We may have access to toilets near the park rangers' house. 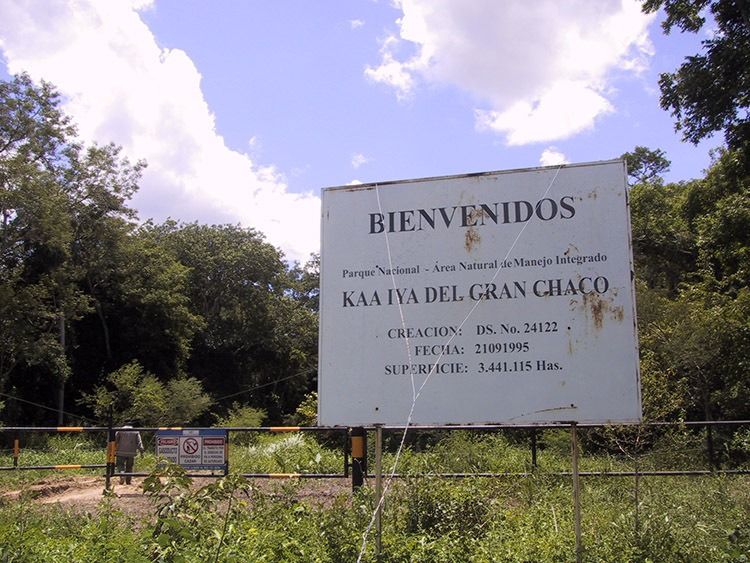 Kaa Iya National Park and Integrated Management Natural Area is located southeast of the city of Santa Cruz, In The Gran Chaco.of the department Santa Cruz Bolivia. It is on the border with Paraguay in the Cordillera Province (Charagua Municipality) and Chiquitos Province (Pailón Municipality and San José de Chiquitos Municipality). Kaa Iya Del Gran Chaco and has a larger surface area than Belgium. At an altitude between 100 and 839 meters above sea level. Its average rainfall is 1,400 to 400 mm annually. The fauna present in the area is representative of the Chaqueña plains region, with 350 registered species, 89 species of snakes, 301 species of birds, 65 species of small mammals and 59 species of large mammals. Foremost among these are the Chacoan peccary, known locally as tagua or quilimero pig, a common species in Chaco, armadillos (Tolypeutes matacus and Chlamyphorus retusus), common in the region, the Chacoan mara and Conover's tuco-tuco. The jaguar, puma, ocelot and maned wolf can also be found. The presence of guanacos has been confirmed in the sand-dunes in the south-east of the Natural Area. The white-lipped peccary, armadillo, giant armadillo, silvery marmoset, black howler monkey, pampas deer, bare-faced curassow, crowned eagle and black-and-white hawk-eagle can also be found here.Also it is the home of the giant armadillo.